2. In a large mixing bowl, combine all purpose flour, pastry flour, sugar, baking powder, baking soda, and cinnamon. 3. In a separate bowl, combine cream, ricotta cheese and vanilla extract. 4. Pour ricotta mixture into flour mixture and, using a spatula, combine until all of the liquid has been absorbed. Then, lightly knead until fully incorporated to form a ball. 5. On a lightly floured surface gently roll out dough to form a 1" thick circle. 7. Using a 2 1/2 " cookie cutter, cut into 10 rounds. 8. Place biscuit rounds on a well greased cookie sheet. Brush tops with cream and sprinkle with sugar. Bake for 10 minutes. 9. Immediately remove from cookie sheet and cool on a wire rack. 1. Wash and hull strawberries and puree in food processor or blender. Empty to bowl and fold in cool whip. 1. Using a fork, pierce around center of biscuit and separate into two halves. 2. Drizzle some strawberry syrup unto halves and place bottom half on a serving plate. 3. Spoon a tablespoon of strawberry sauce onto bottom biscuit half, followed by a dollop of strawberry cream and top with the top side of biscuit. Serve with fresh strawberries on the side. 1. Combine all ingredients, except watermelon balls, in blender and puree until smooth. 2. Serve with watermelon balls and garnish with mint leaves. Wow, these are both wonderful! 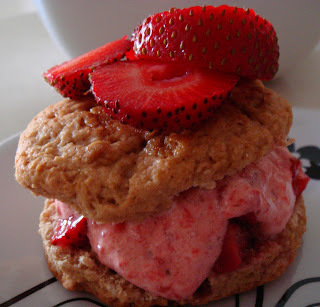 The strawberry shortcake looks much more healthy than the usual. Is the watermelon soup more of a dessert, or a soup? I can get all the ingredients to make these dishes here in Kyoto, Japan, so I am going to try them. Thanks! 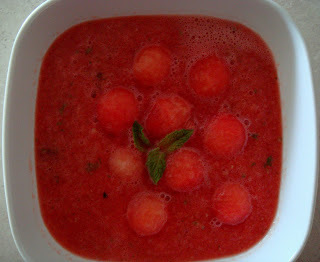 The watermelon soup can be a dessert or even an appetizer because it is so refreshing. Let me know what you think when you try them. It's great that you're from Minneapolis! I love it here. Today we canoed on Lake Calhoun; so much fun! Hope the recipes turn out well. RJ, I am happy you found my blog and this recipe!! Thank you for visiting. Hope to see you here again soon!